In 1928 a group of young people from the Methodist Church in Luton Road, Chatham, decided to stage “The Pirates of Penzance” in the Church Hall. 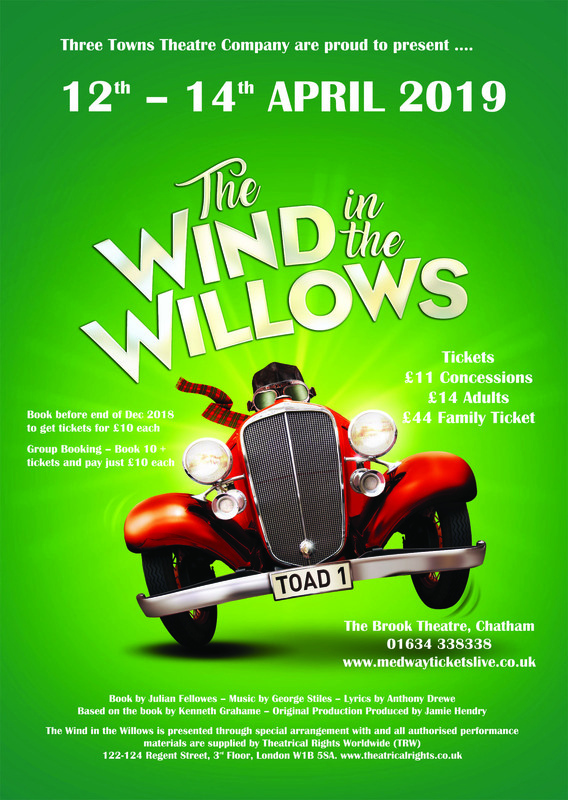 They continued to perform annually in the Globe Theatre, Chatham until 1939, calling themselves The Chatham Amateur Operatic Society and comprised of members from the Medway Towns. After the war, the decision was taken to move to a professional venue – The Theatre Royal in Chatham and in 1955 the Company moved again, this time to the Chatham Empire. A year later they performed “The Country Girl” – breaking away from their Gilbert and Sullivan roots! Four years later they had the honour to produce the first amateur production of “The Merry Widow” and in 1963 were invited to open the new Town Hall Theatre with a gala performance of this show. There they stayed until 1982 when they moved to the larger venue of the Central Hall (now the Central Theatre) performing “The Dancing Years” by Ivor Novello. It was in 1985 that, after some careful consideration, the company decided to change their name to The Three Towns Theatre Company. It was decided that this new name represented the membership at the time, with members mainly coming from Gillingham, Chatham and Rochester. Our history includes many sparkling performances including Kismet, Fiddler on the Roof, My Fair Lady, The King and I, The Sound of Music, 42nd Street, Me and My Girl, Crazy for You, Mack and Mabel, Sweeney Todd, Beauty And The Beast, South Pacific, Annie, Rodgers and Hammerstein’s Cinderella, The Addams Family Musical, Copacabana and Sunset Boulevard. You can find a whole list of shows we have been performing since 1928 by visiting or Previous Shows page.